I am going to explain how to properly cycle an aquarium in a simple yet thorough manner and give you all the basic information you need without forcing you to read a long and boring article and without getting overly scientific. WHAT – What is it? Known by many names: new tank syndrome, nitrogen cycle, ammonia cycle, biological cycle, break-in cycle, aquarium cycle, etc. etc. From here on, I will refer to this cycle as the biological cycle, and this biological cycle basically refers to the process by which different types of good bacteria known as nitrifying bacteria needed to eliminate waste in your aquarium will grow and eliminate waste. WHO – Who needs to understand this? Every single person who sets up an aquarium whether its freshwater, saltwater, reef, tropical or a cold water gold fish aquarium needs to understand the biological cycle because ALL new aquariums MUST go through it. Even after your aquarium goes through the initial biological cycle, the nitrifying bacteria that will grow in your aquarium will always be critical to the wellbeing of your fish. WHEN – When does this cycle begin? As soon as a living thing is put in your aquarium, waste is produced and the biological cycle begins. 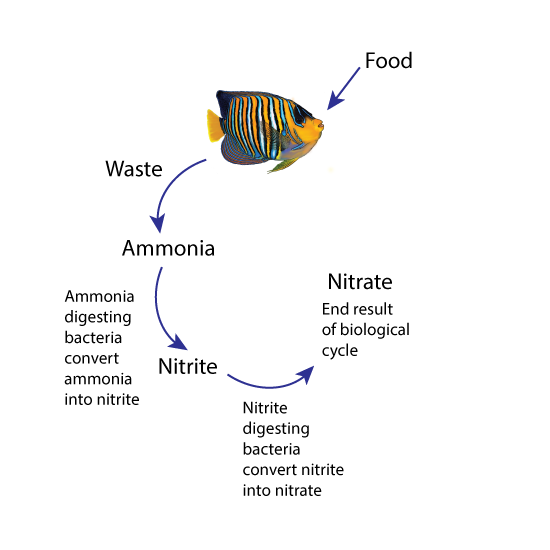 As fish waste and fish food break down, ammonia is produced and ammonia is deadly to all fish. The good news is that your aquarium will eventually break down the ammonia with different types of good bacteria (nitrifying bacteria) that will begin to naturally grow on every surface of your aquarium and in your filter. Great, so why do you need to worry? WHY – Because it takes weeks for the bacteria to grow on their own in large enough numbers in order to “digest” all the ammonia being produced and during this time your fish are subjected to deadly levels of ammonia. Even after enough of the good ammonia “digesting” nitrifying bacteria grow and are able to “digest” all the ammonia as its being produced you are still not out of the woods because this bacteria converts the ammonia into less toxic but still dangerous nitrite. So now the second phase of the biological cycle begins, where other types of good nitrifying bacteria need to grow to “”digest” nitrite and convert it to nitrate. Just like with ammonia “digesting” bacteria, this nitrite “digesting” bacteria take time to grow, and again your fish are subjected to dangerous levels of nitrite until your aquarium grows enough nitrite “digesting” bacteria to “digest” all the nitrite as its being produced. When both ammonia and nitrite levels are at zero the bacteria in your aquarium is now able to convert all the ammonia to nitrite and the nitrite to nitrate which means your aquarium is finally fully cycled. A typical aquarium cycled without the addition of live nitrifying bacteria cultures takes about 4 to 6 weeks to fully cycle, during which time both ammonia and nitrite reach dangerous levels. Unless you cycle your new aquarium properly you will inevitably lose some, or all your fish in the first 4 to 6 weeks after starting your aquarium while your nitrifying bacteria grow in sufficient numbers to “digest” all of the ammonia and nitrite in your water. Lack of understanding about the biological cycle and improper cycling is probably the number one reason people get discouraged and drop out of the hobby. What if I do a water change to get rid of the ammonia and nitrite? You ask…. That is only a band aid as the levels will rise once again until there is sufficient nitrifying bacteria in your aquarium to get rid of the ongoing production of ammonia and nitrite. Basically, there is no way around this process and even after your aquarium develops a good culture of bacteria you can still experience ammonia and or nitrite issues. The most common reason for elevated ammonia and nitrite levels is overfeeding, or putting more food in the tank than your fish can eat. Uneaten food tends to collect in pockets hidden from view where it rots and quickly pollutes your aquarium resulting in high ammonia and or nitrite levels. Always feed your fish slowly, adding food as the fish eat it so that the food does not sink to the bottom of the aquarium or gets sucked into the filter where it will collect and pollute your aquarium. Stop feeding when you see that your fish are starting to lose interest in the food. An overlooked dead fish, too many fish, or the use of medications can also result in high ammonia and or nitrite situations. HOW – How do you cycle your aquarium properly? You can properly cycle your aquarium with fish or without fish. Look at the fishless cycle section of the website for instructions on how to properly cycle your aquarium without fish. Whichever way you chose it is important to add a strong, high quality culture, of live nitrifying bacteria such as our Culture Max or Culture Plus. By adding our live nitrifying bacteria to your aquarium you will cycle your aquarium quickly and safely and you will introduce a stronger and more diverse bacterial culture that will go a long way in keeping your aquarium clean and stable and your fish healthy in the long run. Make sure you purchase a high quality ammonia, nitrite, nitrate, and PH test kit from your local fish store in order to monitor your aquarium. Culture Max is a high performance LIVE biological filter media produced using our Advanced Live-Matrix Technology. We use a super porous material that provides a very large surface area for our powerful nitrifying bacteria to live and grow. The more surface area you have the larger the population of nitrifying bacteria you can house and the more stable your aquarium will be. In fact, Culture Max has over 150 times more surface area than plastic bio balls and many times more surface area than the leading biological filter media. Culture Max contains a huge concentration of different live strains of powerful bacteria to quickly and safely cycle your aquarium. Simply place the Culture Max pouch in your filter, pour the additional bacteria into your tank, add no more than three 2” fish per 10 gallons to provide food for the bacteria and test your water daily for ammonia and nitrite to make sure your levels remain low. It is imperative that you add the fish to the aquarium within 24 hours of adding Culture Max to provide food for the live bacteria. If after two weeks you do not have any ammonia or nitrite you can continue to slowly add fish to your aquarium. Please read the directions on the package or in the product page (link) for detailed instructions and follow them carefully. Culture Plus is created using our Advanced Live-Matrix Technology and contains the same powerful blend of nitrifying bacteria as Culture Max.